Thanks to Dr John Sykes, GP, for putting together this piece. 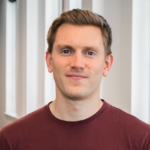 Head to the bottom of the page to find out a little more about John’s work and interests – make sure to check him out on Instagram too where he shares delicious meal ideas and discusses some important health topics. We all know that being physically inactive is not good for your health and can be a risk factor for many illnesses and diseases, including cancer, dementia, depression, heart disease and type II diabetes. Generally as a nation we “move less”, a lot less than we used to. The physically activity guidelines in the UK for those aged 18-65 recommend doing at least 150 minutes of moderate intensity cardiovascular activity with at least 2 muscle strengthening activities each week. If someone does less than 30 minutes of physical activity a week they are defined as being “physically inactive” and this is very bad for our health. 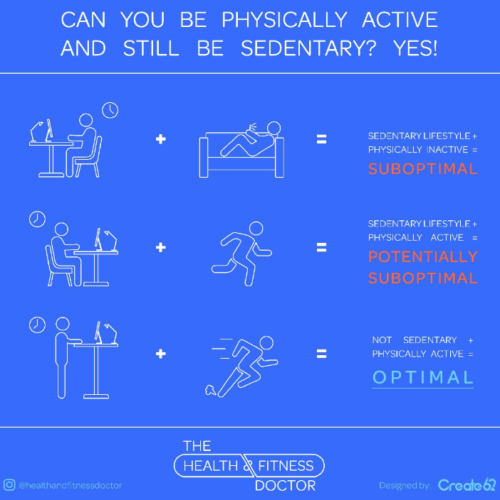 So does physical inactivity mean the same thing as being sedentary? No it doesn’t and being sedentary for long periods of the day is also bad for our health even if we do fulfil the criteria for being “physically active”. So as you can see in the examples above you could be active for 150 minutes during the week with muscle strengthening activities on 2 days and be defined as being physically active but still be sedentary for long periods, which would put you at risk of disease and illness. 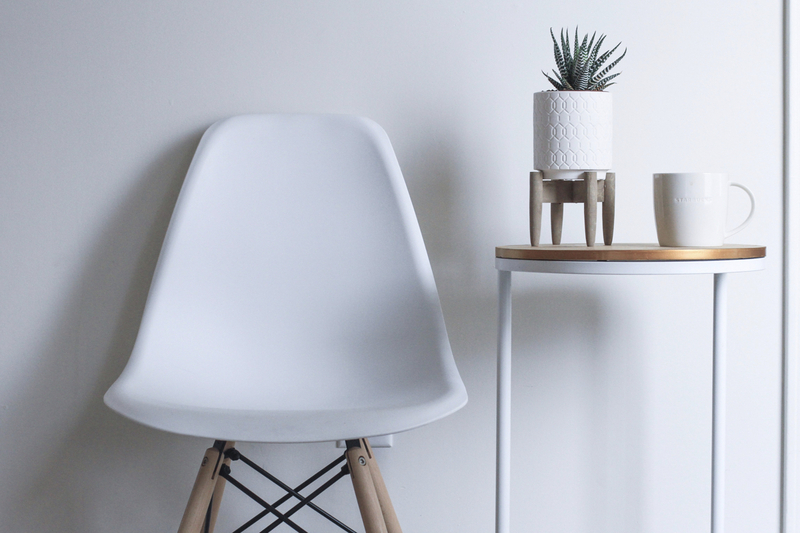 We are in a generation that not only “moves less” but sadly we also “sit more” with many adults spending 70% or more of their waking hours sitting. 2 We do so much sitting that the average person in the UK spends a fifth of every year sitting and around 64 days a year watching TV. 3 Activities such as driving cars or traveling on public transport, sitting at desks at work or watching TV are all sedentary behaviours that we engage with now more than ever before. There is a lot of evidence that this increased sedentary activity has a negative effect on our health. There is lots of research which looks at the increased risk of sitting and TV viewing. It is worth noting that a lot of this research is from observational studies which don’t necessary mean that direct conclusions can be drawn on the cause of the outcome. However lots of these studies do try to account for confounders and still seem to suggest a link between sedentary behaviour and disease. It suggest that an increase in sitting time is associated with heart disease, increased risk of type II diabetes, increased risk of some cancers and also increased risk of dying from any cause. Some of this research even takes into account activity and still showed a link with disease, despite how much activity the study participant took part in. One study looked at heart disease associated with increased time sat in your car and with overall sedentary behaviour. (4) This study looked at 7744 men over a 21 year period of time. They found that me who reported &gt;10 hours a week riding in a car had a 82% greater risk of dying from cardiovascular disease compared to those who did so for &lt;4 hours per week. Those who were sedentary for &gt;23 hours a week had 64% greater risk of dying from cardiovascular disease compared to those doing &lt;11 hours per week. An interesting study took 20 healthy subjects and made them stay in bed for 5 days. 5 Bed rest led to a 67% increase in insulin response, meaning more insulin was needed in response to the same amount of glucose in a meal, which indicates insulin resistance. Insulin resistance is something which contributes to the development of type II diabetes. These subjects also had higher levels of cholesterol and triglycerides in the blood which is also associated with poor cardiovascular health. They also found changes in veins in their legs after 5 days bed rest known to contribute to a condition called atherosclerosis which can lead to heart disease and higher blood pressure. This was only a short study of 5 days but shows what changes can happen in that time by being sedentary which could contribute to a variety of diseases . Does being active get rid of negative consequences of being sedentary? Yes it does…. But you need to do a lot of activity! Much more than most of us do currently. A research review paper looked at all the studies in this area in 2016 and found that those who were sitting for <4 hours a day had the same risk compared to those who sat for >8 hours a day when both groups were very active. 6 The physical activity levels in these groups was around 60-75 minutes of moderate intensity activity per day. So although the risk was reduced by being active, a large amount of activity was required to do this. Interestingly they also looked at those who watched TV for more than 3 hours a day which increased your risk of mortality regardless of how much physical activity you did so not all the risk is eliminated by being physically active if you are watching lots of TV and being sedentary. You can be physically active but still be defined as being sedentary for long periods. Being sedentary has been shown to increase risk of diabetes, metabolic disease, heart disease and there are links with overall mortality (death). It is important to break up sedentary behaviour by breaking up sitting and reducing overall sedentary time whenever possible. 1. Try to break up sitting for long periods. You could set an alarm to get up and move every hour. There is also a brilliant app called “Rise and Recharge” which monitors your sedentary behaviour and can set reminders for you to move at set periods. 2. Turn a coffee break into a walking break. Nice way to break up your sitting behaviour during the day when you may otherwise be sitting. The coffee can come with you! 3. Get a standing desk. You can buy stands which can allow your computer or laptop to be at a level which allows you to stand. This greatly reduces your sedentary behaviour as just standing is much better for your body than sitting. 4. Change the meeting to an active meeting. Make that meeting at work or with friends or family into a walking meeting. 5. Walk and talk. When you have a phone call, could you walk around while you talk? It would be much better than sitting while talking. 6. Plan a swap of time you would usually be sedentary in advance. Planning in time when you go for a short walk or even standing will reduce your sedentary behaviour and making sure you plan it will increase your chances of doing it. 8. Drink more water. This will make you have regular loo breaks which will allow you get up and stretch your legs. We also know keeping well hydrated is important for general good health. 9. Put on some tunes and have a boogie. I love music. When my favourite music is on I can’t help but dance around. Try it to break up some work at home with a boogie to your favourite song. Maybe don’t do this at work… but maybe do and get others involved! 2. Owen N, Sparling P, Healy G, Dunstan D and Matthews C. Sedentary Behaviour: Emerging Evidence for a New Health Risk. Mato Clin Proc. Dec 2010;85(12):1138-1141.